At the 2016 Concorso d'Eleganza Villa d'Este, Aston Martin and Zagato showed what was a prologue to a new chapter in the successful partnership between the British and Italian companies. 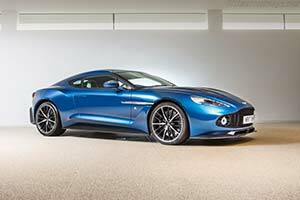 What the two companies revealed was Zagato's take on the latest Vanquish. The car was shown in concept form but it was shortly thereafter announced that not only a Coupe but also a Volante, Shooting Brake and Speedster version would also be offered. All of them were built in limited numbers with 99 each of the first three and just 28 of the Speedster. A collaboration by Aston Martin chief designer Marek Reichman and the Italian specialist coach builder, the Villa d'Este show car was immediately recognisable as a Zagato design thanks to the double bubble roof. Another striking feature was the wrap-around glass, further accentuated by the dark A-pillars. The headlights were a refinement of the 'regular' Vanquish but unique to the Zagato version were the round front fog-lights and the circular taillights. The latter included the bladed LED technology also seen on the Vulcan track car. The all carbon-fibre composite body was mounted on the 'S' version of the Vanquish, which featured a 592bhp version of the naturally aspirated V12 that was mated to an eight-speed automatic gearbox. Carbon ceramic discs were also standard equipment as were the 20-inch alloy wheels. Inside, the Vanquish Zagato boasted a bespoke interior. It was upholstered with quilted leather seats and door panels, while much of the trim was bare herringbone carbon fibre. Production of the customer cars started late in 2016 with the four versions being built in order; first then Coupe, then the Volante, Shooting Brake and finally the 28 Speedsters that were completed in 2018. The complete run was sold out with the Coupe version starting at $775,000 in the United States.